Just got a letter from Godfrey Marine about a recall on all Hurricane 187 SDS and 188 SDS outboard boats built between September 2015 and November 3, 2017. Seems these boats do not comply with US Coast Guard flotation requirements ! This makes me wonder about quality control at Godfrey. I already had to bring my 188 back for 5 gel coat blisters ( a quarter size) on the lower transon after 1 season of use. I was just notified of the recall by the previous owner, I’m the second owner. However, when I tried emailing Godfrey Marine at the recommended email the email bounced back because lack of address. [email protected] does not work.. I too just received my recall on the floatation issue. Need to get with my dealer and schedule the recall(probably towards end of season).2011 SS188OB. Just had a transom gel coat blister also, fixed it myself though. Flotation Test For Persons Capacity- FAILEDStability Test (Starboard)- FAILEDStability Test (Port)- FAILED Mailed 10/5/17 w dnr/cur- CC 10/19/17 rec cert ml rec.-CC111417 - MNF RETESTED CORRECTED BOAT THEMSELVES. WILL SCHEDULE REPAIR IN RBTF AND RETEST IN RBTF TO CONFIRM COMPLIANCE. FINALIZING DN LETTERS AND REPAIR PROCEDURES.122217 - MNF SUBM MODIFIED PLAN TO ADD FLOTATION. WILL DELIVER BOAT FOR RETEST. PLC. 2/9/18 mailed passing retest, DNR/CUR-CC022718 - MNF WILL RETEST AT THEIR FACILITY ADDITIONAL FOAM TO ENSURE IT WILL ALSO COMPLY WITH THE UPCOMING S-30 WEIGHTS.3/15/18 rec cert mail receipt-CC040618 - MNF WILL CORRECT BOAT IN RBTF FOR RETEST.061118 - MNF SUBM DNL, BUT LANGUAGE NEEDS CORRECTION BEFORE MAILING. NO DNR YET.061818 - DNR DNL RCVD. REPAIR KIT INSTALLS 4 CU FT FLOTATION FOAM TO STBD AND 2.5 CU FT TO PORT STERN AREA. I too received a letter from Godfrey on my 2016 Hurricane. I called my local dealer down here in the Florida Keys. They are washing their hands of the recall and gave me a number for someone who is handling the recall as a 3rd party for Godfrey. I have emailed and spoken to him but nothing as far as a time frame here. I live on the water and want to boat the rest of the summer but it sounds like this is serious and you should not be driving this boat at all. I just sent another email tonight telling them that this is unacceptable and I need a time frame. This is interesting and very disturbing at the same time. We must be talking about hundreds of boats that are involved here. I have had my 187 OB since I bought it new in 2014. How come it took 4 years to decide that there is insufficient flotation foam installed on this particular model and if so, how did these boats pass the original Coast Guard certification process? My dealer NJ Outboards has been notified that I received the letter and has ordered the foam kit but it bothers me that I paid big bucks for a new boat that was supposedly certified properly and safe to operate, used it regularly in the sometimes rough Barnegat Bay all these years thinking that, and now they are telling me that it isn't. Good thing it didn't get swamped and sunk by some yahoo in a bigger boat flying past at full speed. Kinda reduces my faith in the manufacturer's original quality control processes. What else did they miss the mark on I wonder? It has been nearly two months since I received my notice of recall for the flotation issues on my 187 SD...I have been calling every number I can find and on the rare occasion that someone associated with Hurricane actually answers, I repeatedly get the run around...I called and left messages again this week and now 4 days later there has been no reply...Hurricane-Godfrey sold us as it would appear an UNSAFE VESSEL...They should be bending over backward to make this right instead of making us track them down for the fix! The bottom line here is that if the boats in question were built with insufficient floatation foam from the get go then the certification sticker that Hurricane placed on every single boat is meaningless plain and simple. Insufficient now should have been the same then as well. Boats don't sink faster in 2018 and therefore need more foam installed then on previous years. To me, this sounds like a serious safety problem here involving a lot of boats dating back quite a few years. The authorized Hurricane dealers who sold them originally have to fix the issue asap at zero cost and aggravation to the owners and if they won't or can't like some posters here have indicated then the manufacturer (Godfrey) must be held completely responsible for letting this serious quality control situation happen in the first place. Perhaps a class action consumer lawsuit involving all owners of the SD 187 model inboard and outboard is in order to force the company to buy them all back at full price. I finally got a response from my hurricane dealer. He said they are awaiting a fix for the flotation problem from Hurricane. Wow, I can hardly wait for the the actions needed to correct. No warranty work will be done during the season, too busy. Completely agree with you sullmate. You gotta wonder just how they intend to install this so called foam 'kit' involving 4 cubic feet to the starboard and another 2.5 cubic feet to the port stern area since it's dealer mechanics doing the work and not the factory itself. If they intend to shoot spray foam inside the hull after drilling access holes in it then it's possible that this could affect water drainage to the bilge area. If it's not spray foam then to install sheets they have to do some serious dissembling of the deck to hull seam to get to the area needed. Either way I am not very happy with the whole thing at all because this never should have happened in the first place. Somebody really dropped the ball here. It would be nice to hear some kind of official informational response to SD 187 owners from Hurricane on this forum about what is actually involved with the fix and do they intend to train the dealer mechanics as to the proper repair procedures involved so it is done correctly. Steddyfretter, As you stated there should be a class action lawsuit since there will be boating downtime as well as the real possibility of an improper or damaging repair. We have been told NOT to sell our Hurricanes until the repairs are made. I wish I were a lawyer. If Godfrey Marine thinks this issue is going to go away quietly. They are wrong!! Monetary compensation is Due. I believe the only way to get ourselves taken care of is a Class Action suit. Our local dealer will not be doing any recall repairs. So they have simply washed their hands of this. I have had several calls with Doug who is coordinating the repairs from Texas but I continue to get excuses. Nothing is going to happen for weeks or months. We want our money back. We don't want this boat now. Even if they say they fixed it I don't trust it any longer. How can we all get together and get a suit going? I'm onboard with this...I love my 187 SD, but I'm not sure if I can trust the repair offered and what of the resale value now that this problem has been exposed? So what happens if the boat gets swamped or the hull gets compromised from hitting an obstruction at speed? It goes turtle because of the foam inbalance and turns into a submarine? Scary thought. On the official Hurricane website concerning construction of ALL of their boats it clearly states that every available cavity is filled with closed cell urethane foam floatation for added safety and convenience. According to them, this is a good reason why you should choose Hurricane over other boat manufacturers. Sounds wonderful, I took them at their word, and was one of the deciding factors in buying my boat in the first place. Now they are officially admitting in this letter from Godfrey that their past quality control was obviously flawed and telling me not to sell it. So here we have a boat that fails Coast Guard certification but the manufacturer put a sticker in the cockpit stating otherwise. Wow, if that isn't the cat's meow. Consumer lawyers should have a field day with this one. I really wasn't planning on selling it because I actually like the boat but now even if I wanted to, who is going to buy it? So much for resale value. I wonder how this recall came about. Did one actually sink? I had a similar issue with a Stratos fish and ski some years ago. Dealer stuffed long sheets of foam into the cavities surrounding the bilge area on both sides. I don't see much space back there in my SD 195 OB (similar hull) for doing that. 4 cubic feet of foam is 4 boxes, 1 ft x 1 ft by 1 ft. Like was mentioned, they will probably drill an access hole and pump foam into the hull. To put this in perspective if the boat was 1 foot longer the coast guard doesn't care about flotation is there and it can sink like a rock. Called my dealer yesterday. They said no flotation repair kit has been sent from Godfrey Marine, yet. Has any hurricane dealer received the kit and has anyone had the repairs done? It seems Godfrey doesn,t want to deal with this issue. Frustrated !!! I am becoming increasingly frustrated with Godfrey Marine as many Hurricane boat owners have stated in this forum. I contacted my dealer as well as another close by dealer and neither have any understanding when the repair kits will be provided to resolve this issue. It is fast approaching 90 days since we received the initial notice of the problem. anyone considering buying a boat from Godfrey Marine should be aware of the poor customer support and defective products. So today I paid a visit to the dealer where I bought the new boat from to find out if they had heard anything. It had been well over a month since they told me they were going to order the foam floatation 'kit' required for this recall. According to the service people I spoke with this morning, there are no such kits as of now and Hurricane has put a hold on this thing until they can figure out exactly how this much required foam can be installed in the very limited space of the 187 hull. Once they come up with the proper repair procedure, I was told that the factory will send out 'teams' to each of their authorized dealers to instruct the techs how this will all take place and they will then call the boat owners to set up a date. I am now on a waiting list with no definite timeframe. Hopefully I am not number one as that job could end up being full of problems. In a couple more weeks the boat is coming out of the water and will be on a trailer in my yard. They can come and get it whenever they want. That's where we are at this point in time. we deserve a repair and a refund or credit from Godfrey Marine for this poor response to "their" flotation problem. I think we should receive a least $5000., for our troubles. REMEMBER DON'T SELL YOUR HURRICANE UNTIL REPAIRS ARE MADE, Per original notification letter. (2) Rated for outboard engines of more than 2 horsepower. (b) This subpart does not apply to sailboats, canoes, kayaks, inflatable boats, submersibles, surface effect vessels, amphibious vessels, and raceboats. Monohull boats under 20 feet in length and rated for more than two horsepower must comply with the more sophisticated flotation system called Level Flotation. The Level Flotation system requires that the swamped boat, loaded with certain weights representing weight capacity, part of persons capacity and some equipment, must float in an approximately level position and not heel past a certain angle, even when part of the passengers’ weight is on one side of the passenger carrying area. Section 5.0 covers the requirements and tests to perform. 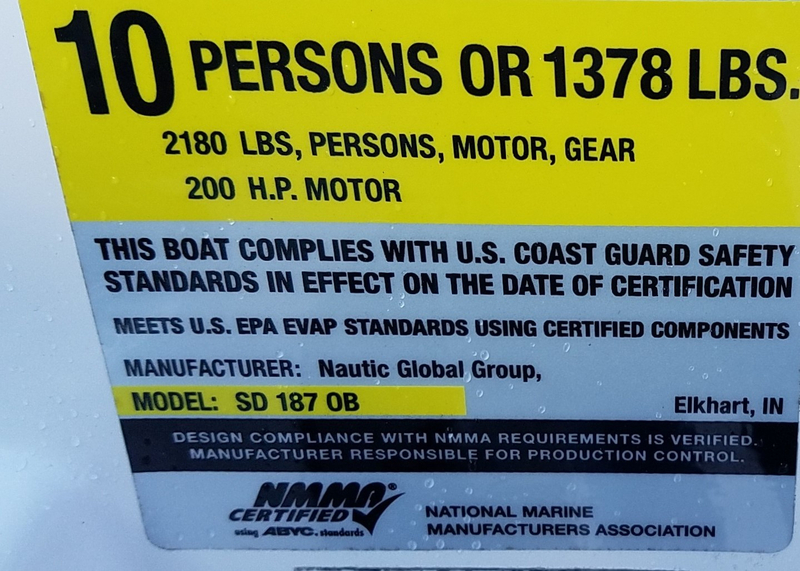 Attached is a photo of the certification sticker on my 2014 Hurricane 187 OB which clearly states that the boat supposedly passed all CG requirements on the date of manufacture not to mention being NMMA certified as well. (National Marine Manufacturers Assn.) Apparently not true according to the recall letter we all received. Steddyfretter, I too bought my boat from NJ Outboards and the first I heard of this recall was when they called me today. I never received a letter. They wanted to know where my boat was and if it was wrapped yet. They told me the manufacturer is sending an engineer next week. It is still sitting in the yard waiting to be winterized. I have a 187 OB and I have serious concerns on how they can properly install these foam blocks without cutting up the interior deck. has anyone else heard anything further or had the actual repair made yet? Ripcurrent.....If you are on the recall waiting list at NJ Outboards you should be getting a call from Ray Ellington who is the Hurricane representative handling the scheduling of this recall. His number is 423-519-0840. According to Ray the job takes a couple hours to do and involves installing a new access plate somewhere to shoot floatation foam thru and also they shoot thru one of the cupholders. It can be done at my house where the boat is on a trailer. I don't need to tow the boat to the dealer at Pine Beach. All they asked for was access to electric and the boat being uncovered. After all this is done I want some sort of written documentation from the manufacturer that this repair procedure will enable the boat to be current with all Coast Guard floatation requirements. Otherwise it might affect the resale ability. steddyfretter, do you know where the access new plate is? I don't like another access hole to be cut. There are two already in the deck. Perhaps they can use an existing access plate?? I haven't heard a word from my dealer in Ct.
Sullmate....My boat was done this week. They put a small access plate under the stern ladder on the starboard side. Can't be seen when the lid is stowed. I was told that this is how these particular boats will be identified as having the recall completed properly. The port side entry was thru one of the cupholders which also can't be seen. There were two guys from the factory in a white van who came to my house to do it. According to them they are travelling from state to state. The job took about two hours to shoot the foam in. My impression is that this is a totally factory operation and the dealers are not involved with it at all which might explain why you haven't been contacted by yours. NJ Outboards where I originally bought the boat 4 years ago at least kept me advised as to the status of the recall. You might want to call this fellow Ray Ellington 423-519-0840 and see when the recall techs will be in your area. I appreciate the update. Much appreciated!! It would have been nice if Terry Gipson or someone from Godfrey Marine sent owners an update but this is probably asking too much ! Abosolutely Sullmate. This is a major public relations disaster for Godfrey. First they send out letters saying we could end up drowning because of their manufacturing screwup if the boat gets swamped then they keep everyone in the dark for months including their dealers. Now they have to deal with cranked up concerned boat owners who simply want to be kept in the loop concerning the seaworthiness of their vessels. We're only a small minority on this forum. How many others are out there scratching their heads wondering where they stand? Should they continue to use their boat as it is or should they not? Forget trying to sell it without having the floatation issue resolved. I'm sure Godfrey will feel consumer repercussions from this for years to come and they only have themselves to blame for this mess. Sullmate, the guys who came to my house to do mine did say that the outside air temp can affect the curing of the foam. They got here at 9am and had to wait a little until the sun got higher. Here's hoping everything goes good for you and that next boating season will be better weather wise than this last one. Only put 50 hours on the boat this summer which is half of normal. Every time I wanted to go out either the wind was blowing hard making the bay rough or there were just a lot of other boats out there creating big wakes. I found that the 187 is great up to a medium chop but anything over that the ride gets a little rough. Smart tabs on the stern helped somewhat tho.